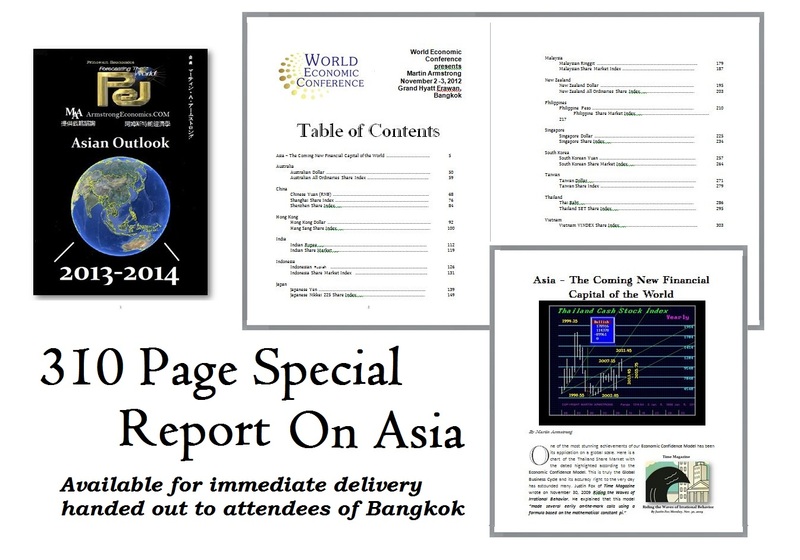 This is perhaps the most comprehensive report on Asia we have every produced delivered in six parts with 310 pages. The countries covered are Australia, China (Shanghai & Shenzhen), Hong Kong, India, Indonesia, Japan, Korea, Malaysia, New Zealand, Philippines, Singapore, Taiwan, Thailand, and Vietnam. Each nation is covered with its share market and currency (Vietnam is omitted from the currency review). You will find the reversals, charts, and the forecasting arrays. This report shows coming explosive moves to the upside such as India and the final collapse of Japan as early as next year. While European nations are being downgraded for their credit ratings, both South Korea and the Philippines were upgraded. This is the most comprehensive look at China and its currency. Here is the driving force for the next few years. To understand the rise of Asia and the fall of the West, this report is essential to all investment decisions for the next few years.